Yehoshua Kadosh is the head instructor of the Kenpukan dojo in Jerusalem, Israel. 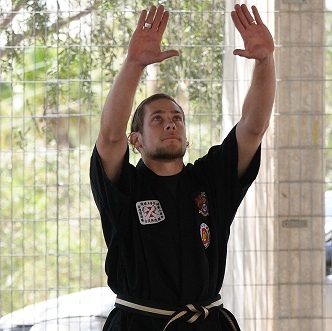 In 2001 Yehoshua began training in Ryukyu Kenpo with Grand Master D'veed Natan. As he quickly rose in rank he began to teach children as an assistant instructor to Hanshi D'veed Natan at the Ryukenkan dojo in Jerusalem. In 2004 Yehoshua was instituted as Director of the Children's Training Department for the Ryukyu Kenpo Kobujutsu Kai. Also, having been a skilled sparring student he was given the responsibility of teaching sparring classes for adults at the Ryukenkan dojo in Jerusalem. Since 2008 Sensei Kadosh has run his own classes in Ryukyu Kenpo, Bogu Kumite and Kobujutsu at various locations in Israel. Yehoshua Kadosh won 1st prize in the Israeli National Open championships for Kobujutsu and Traditional Kata. By April 2015 he was promoted to Director of Research and Development of the Ryukyu Kenpo Kobujutsu Kai. Yehoshua Kadosh received his 7th Dan rank, and Daishihan Menjo (full instructor's teaching license) from 10th Dan Grand Master D'veed Natan on 1st July, 2017. Renshi Kadosh is a graduate of the Wingate program at Tel Aviv University, studied "kappo" (resuscitation techniques), and trained in first aid with Magen David Adom professionals. Teaching has become a specialty with Renshi Kadosh not only because of the patience and care that he shows to his students, but also because of his methodical approach to teaching and attention to detail that ensures complete understanding of the material demonstrated.